Professor Austin teaches bankruptcy and commercial law. He has written articles on consumer and business bankruptcy, as well as two books, Graduating with Debt: Student Loans Under the Bankruptcy Code and Reaffirmation Agreements in Consumer Bankruptcy Cases. He is working on his third book, Fundamentals of Business Bankruptcy, to be published by Wolters Kluwer in 2015. 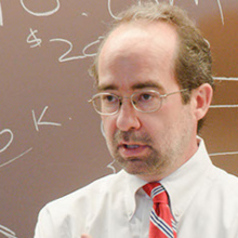 In addition, he served as a contributing editor to Norton’s Bankruptcy Law and Practice (third edition), and as a contributing author to Newberg on Class Action (third edition). He is a frequent speaker on bankruptcy law at national and international conferences.